This online Noise Awareness Training course looks at what can be done to recognise and reduce exposure to noise at work. Particularly suitable for those working in Construction or Industrial environments, as well as Hospitality and Leisure professionals. Regular exposure to loud noise can affect your hearing. This noise awareness training programme looks at who’s at risk, what those risks are, and how to reduce them. More than 11 million people in the UK suffer with forms of hearing loss and over 900,000 people are profoundly or severely deaf. This online course looks at how your ears work to illustrate how delicate they are, how easily they can be damaged, and why noise-damaged hearing loss is permanent. It covers safe noise exposure levels and looks at what can be done to reduce exposure to regular loud noise or to sudden extreme noise. This training programme will help you to recognise the early warning signs of hearing loss, so that something can be done before it’s too late. High-risk environments for noise exposure include Construction Sites, Factories or Industrial production lines, and some Hospitality venues (nightclubs, live music etc). 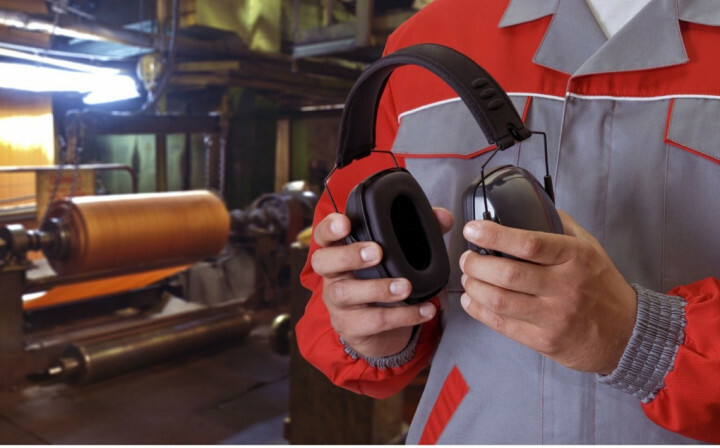 This simple and easy to understand course is broken down into 3 sections: the details of the ear itself & how it works, noise & the responsibilities of employers & the hearing protection you may require. Due to abrasive wheels emitting high levels of noise, this noise awareness course works perfectly alongside our Abrasive Wheel Safety Course! The Noise Awareness Training course is broken down into 3 sections. All sound is noise, but the noise we are considering in this programme is noise that might damage your hearing. And noise doesn’t always have the same effect. It depends on how loud it is, how often you hear it and how long it goes on for. Loud noise could cause temporary hearing loss, it might cause permanent hearing loss. This section explains how your ears work to help you understand how easy it is to damage them and it looks at the damage that can be done. It also tells you what to look out for to recognise the first signs of hearing loss. In this section we look at how noise is measured, at what level it becomes damaging and what must be done when it reaches this point. We also look at noise limits, hearing tests and who is responsible for protecting your hearing. Hearing protection can help to protect your ears by reducing noise by around 15 to 32dB, depending on the type of protection. There are many different types of hearing protection available. In this section we look at the options and when you should wear protection. This Noise Awareness Training course concludes with a 20 question multiple choice test with a printable certificate. In addition, brief in-course questionnaires guide the user through the sections of the training and are designed to reinforce learning and ensure maximum user engagement throughout. Your Noise Awareness Certificate includes your name, company name (if applicable), name of course taken, pass percentage, date of completion, expiry date and stamps of approval or accreditations by recognised authorities. Based on 148 real user reviews. The course started by explaining in a detail how the ear worked and how hearing loss occurred. This was a positive way to introduce the reasons for protecting our ears against excessive noise. An important training course on hearing which is interesting and very informative. It's good to understand how the human body works, sometimes we forget how sensitive it is, therefore we can act before any damage is done. Thank you! Intresting and to the point. I particularly enjoyed the biology of the situation explain exactly what loud noises do to the inner ear. A very thorough course. Read our full reviews for Noise Awareness Training. Suitable and sufficient information and training (must be provided) for employees, such that work equipment may be used correctly, in order to minimise their exposure to noise. The Health and Safety at Work Act 1974 and The Management of Health and Safety at Work Regulations 1999 together ensure that employers have legal responsibility to ensure the health and safety at work of all employees. And this includes making sure employees are safe when working where noise can be loud or excessive. Noise Awareness also falls under the Construction Design Management Regulations 2015. You can view the iHASCO CDM guide here. Who is our Noise Awareness Training for? This course is perfect for anyone who regularly works in environments or uses equipment that exposes them to high levels of noise.The course may also prompt you to assess your workplace and identify specific places or things that could expose workers to dangerous levels of noise, allowing you to take necessary measures and minimise risks to your health and safety. Placeholder image for How do I manage noise levels at work? How do I manage noise levels at work? Placeholder image for Is Silencing Big Ben to Protect Workers Hearing the Right Thing to do? Is Silencing Big Ben to Protect Workers Hearing the Right Thing to do?